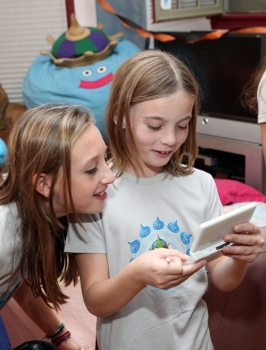 Sony says that the Nintendo DS family is great for kids that need babysitting, but isn't for adults. In anticipation of the release of Sony's new handheld codenamed NGP, the PR storm may have begun. Sony Computer Entertainment of America president Jack Tretton has come out saying that the Nintendo family of handhelds is nothing more than a "babysitting tool" for youths. Speaking to CNN Money, Tretton first took a shot at the Wii and Xbox 360 (but mostly the Wii), saying the two consoles are running out of steam. "Why would I buy a gaming system without a hard drive in it," Tretton posited. "How does this thing scale? Motion gaming is cute, but if I can only wave my arms six inches, how does this really feel like I'm doing true accurate motion gaming?" Tretton praises Sony for taking a chance with more cutting edge technology like the Cell Processor and a Blu-ray drive at launch, though it took quite a loss for the privilege. The advantage is that Sony now faces what Tretton calls a "downhill roll" with the most relevant console on today's market. Sony may aim to take the same approach with the NGP, as Tretton says Sony looked at every "bell and whistle" for the device. He doesn't appear to think it'll be tough to compete with the Nintendo DS family, whose most recent iteration came in the form of the 3DS, which provides what he calls the "Game Boy experience." "Our view of the 'Game Boy experience' is that it's a great babysitting tool, something young kids do on airplanes, but no self-respecting twenty-something is going to be sitting on an airplane with one of those," Tretton said. "He's too old for that." Typically I can understand where executives are coming from with their competition-bashing comments, but this one is just plain stupid. In an age where we're still trying to get videogames recognized as a hobby for people of all ages, Tretton is taking us backwards by somehow turning a very popular handheld game system into a kid's toy. I question how the NGP will somehow magically be "for adults" simply because of its improved internal components. Sony can bash Nintendo all it wants, but it shouldn't bash millions of gamers, and its audience, at the same time.